We live in a world where we carry our personal world and information in our pockets confined into a small container or a small object known as USB Flash Drives or can say in other words a pen-drive, flash drives and portable HDDs. The dimension of portability got an all new magnanimous meaning in a short name i.e. USB Flash Drives. We all know that with such provisions carrying of data became easy but simultaneously there is also an increase in risk observed. So in this article I present the information through which you can make your data get carried away in a more secure manner. It will help you prevent from getting your data stolen and prevents data loss. A control on over who is using your device. The transparency increases which makes you know who is accessing the things. Gets your data encrypted easily making them more secured. Provides an eye to look of what data are getting transferred. The amount of data getting transferred can be controlled. Encrypt Stick runs on any USB flash drive including older USB 1.0, current USB 2.0 standard, and even upcoming USB 3.0. Performance may vary according to the read and write speed of the flash drive. Encrypt Stick Installs in seconds, and turns your flash drive into your own Digital Privacy Manager (DPM). Take your DPM with you and use it on any PC or Mac anywhere in the world. Rohos Mini Drive protect USB flash drive with a password by making hidden and encrypted partition on the USB flash drive memory. If you have many private files on the USB drive and want to keep them in secret, you can protect them by a password and strong encryption with Rohos Mini Drive. 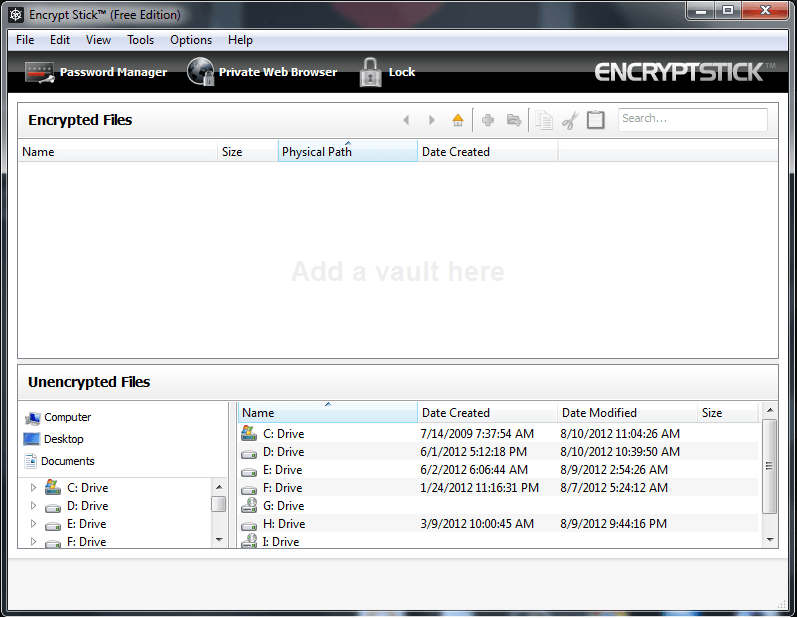 Also it offers a portable encryption tool to work with encrypted partition on any PC. Power Protection for your USB and External Drives!A protection application for all types of portable media including USB flash drives, thumb drives, memory sticks, external drives, and memory cards. Data protection is PC independent and does not require installation and any administrator rights at the other end.With USB Secure, you will never have to worry again about lost or stolen USB/External drives.USB Secure offers multiple protection layers ensuring maximum security of your password-protected data on any portable medium. USB Secure secures your sensitive data against theft, accidental loss, and data leak.USB Secure does not install any kernel or filter drives, taking away the hassle of requiring administrator rights to password protect portable devices.Protecting your sensitive data with USB Secure is a one-click process, requiring no lengthy installations. Access to your protected data on a portable drive is convenient too. You can choose to open and browse your data sets or simply explore as read-only. 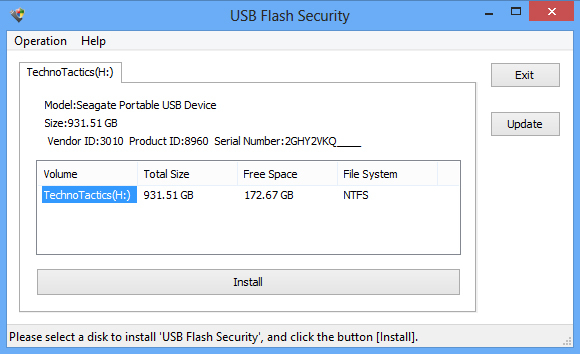 USB Flash Security is a application that can provide your USB flash Drives with security and by encrypting them. The user interface of this software includes a conventional window in which you can choose an available USB flash drive and Hit the “Install” button. Then, you can add a security password and additionally a sign. also, you can allow the system to secure [AES256] the “Protected area”. and Remember, when you set up it on your USB Flash Drives, Data and all information will be removed but Don’t worry you are warned by the software), so you have to back-up your data and all information. It provides a easy and efficient Solution when it comes to password-protecting to your USB flash drives. So, I just want to append my conclusion here that try out these options and you’ll get better results. I would be glad to get your opinions or options for the same. These are really great applications to keep the content of your flash drive safe. 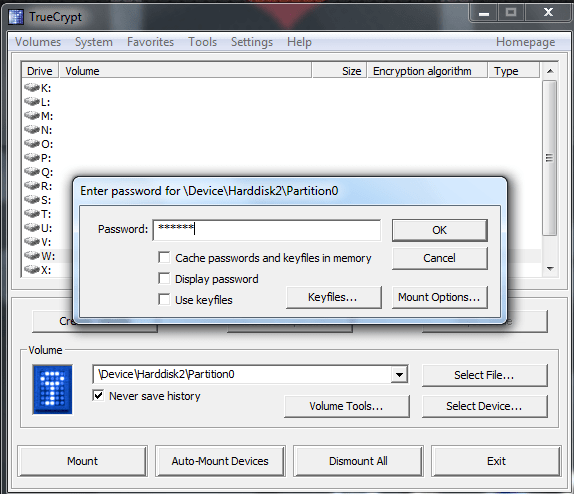 I have been using Truecrypt for long and i must say its an awesome application. I was searched for these kind of software long back ago and I couldn’t find one. Finally I end up in using bitlocker. BTW, what’s the difference between BitLocker and these software? Thank you for Commenting by and sharing your thoughts. BitLocker is a good choice but all this free software is easy to use and not time consuming process but when we setup BitLocker for our drives it take too much time for setup. So Finally, this all Software provides a simple,effective and convenient solution when it comes to password-protecting your USB flash drives. We highly recommend it to all our readers and users. Really these days we carry USB drives along with our important documents on it. If we loose that then it will be a serious problem for us. You have written a great post here that is related to password protect USB drives. All of the software above are freeware and hope they will work for me. This is what i am searching for. Thanks for your share. some are new going to try them! I never knew that that USB flash drives can also be protected this way. Valuable tutorial. Thankyou for sharing. I was looking for these kind of softwares from a couple of weeks, Thanks for sharing this list. Nice list of USB protection softwares. I was looking for these kind of softwares from a couple of days for my external hard drive.